Boston's decision to permanently set up a dedicated weekday morning bus and bike lane on Washington Street between Roslindale Square and Forest Hills was based not just on surveys of people taking the newly speeded up buses during two pilot runs but on data collected in a 2016 study about just whose cars would be displaced by the elimination of parking in the morning. Read more. That didn't take long at all: The Boston Transportation Department today announced it will create a permanent morning lane just for buses and bicyclists on Washington Street between Roslindale Square and Forest Hills - a week after it ended a pilot to see if the idea could work. Read more. The State House News Service reports on a $1.2-million pilot project on several bus lines, to begin in September. With the end of a month-long pilot of a bus/bike lane on Washington Street, the stretch between Roslindale Square and Forest Hills was back to its usual gridlock this morning, the LivableStreets Alliance reports. The T and the Boston Transportation Department barred parking on the northbound side of the street in the morning rush hour to gauge how well a dedicated lane would work. Now we wait for the results of their studying. Transit Police report they are looking for a guy who robbed another passenger on a Route 16 bus at Old Road and Ellington Street in Dorchester, around 1:50 a.m. on May 11. Read more. Transit Police report arresting a Cambridge woman they say punched a driver in the face when he wouldn't let her off in the middle of the street yesterday afternoon. Transit Police report the death of Kathleen Callahan, 47, following a crash in Saugus yesterday. Read more. WBZ reports a bullet shattered the windshield of a 1 bus in the area of Melnea Cass Boulevard and Albany Street shortly after midnight. No injuries. This woman moved around the upper busway at Forest Hills this afternoon, proclaiming the end was no longer nigh, it was here. She spent some time on the sidewalk and some time in the busway itself, proclaiming a warning or promise to people who mostly tuned her out. At one point, she stood at the edge of the 36/37 berth and continued to give witness even after both buses left and the berth was completely empty. Alight is a startup by some MIT grad students who think they have a bus-schedule app that could turn into a bus online community. Their app (currently just Android) will let you see when the next bus is coming - and then, as you ride, tell you stories about the buildings and places you pass. Read more. Shortly after 5 a.m., the first of the new SL3 buses left Chelsea for South Station by way of Airport, and running in part on a dedicated road atop an old rail line. Read more. Even with a guaranteed - and free - parking space in the City Hall garage, at-large City Councilor Michelle Wu usually takes the T to work from her home in Roslindale. This week, she decided to experiment and up her game - and try to get around Boston only on the T and Hubway. She chronicled her experience: Read more. Mayor Walsh today announced a series of steps aimed at speeding bus service in Boston, which he'll pay for in part by increasing parking fines. Read more. The MBTA this week added some additional buses on weekday mornings to to the 16, 19, 31, 32, 65, 70, 104, 109 and 455 routes. The 109, 117 and 455 routes get some extra service on Saturday mornings; the 31, 109 and 455 on Sundays. Photo of T bus by Rick Macomber, photo of school bus by Jenn Brandel. Updated with statement by Transit Police. Transit Police report the driver of a 44 bus didn't stop for a flashing red light at Columbus Avenue and Washington Street around 5:45 a.m. and ran into a BPS school bus already in the intersection. Read more. If you lined up every bus in Boston, what would you get? The Herald reports the T is soliciting bids from companies to run buses between 1 and 4:15 a.m. from Mattapan into downtown and then up to East Boston and Chelsea for a nine-month pilot. 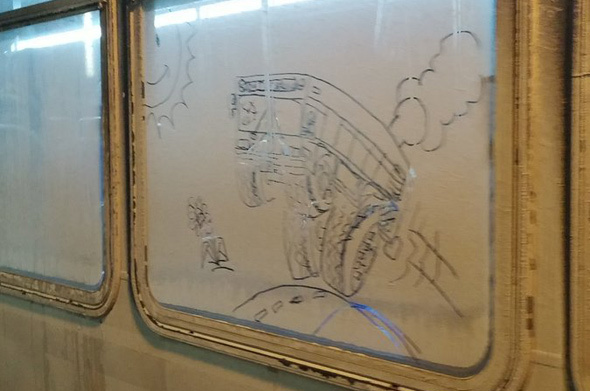 Kellie Veiga spotted this artist's conception of an express bus on fhe side of a 556 yesterday. Commuters see their Departed on Boston's Red Line subway trains.